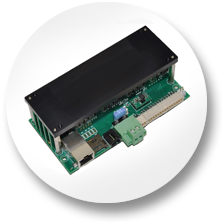 Our Ethernet controlled LumiBright and Aurora Drivers and Controllers feature low profile, fully integrated power solutions with fast response times. and are compatible with our Light Engines, Projectors, DMDs, and Fiber-Coupled devices. and are available in standard power and high power (including UV) versions. © Innovations in Optics, Inc. All rights reserved.